Lilian Verner-Bonds’ The Complete Book of Color Healing explains how to help relieve migraines by self-administering color acupressure along with repeating a healing affirmation. 1. The healing color to visualize for migraine acupressure is indigo. It can help to spend a little time looking at the color of indigo before starting the treatment. 2. 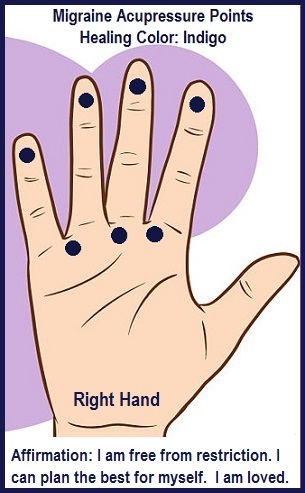 Locate the pressure points (see illustration), then close your eyes and begin visualizing the healing color of indigo as you start gently apply pressure to each of the points shown. 3. Repeat the following affirmation: I am free from restriction. I can plan the very best for myself. I am loved. 4. Continue treatment for five minutes at a time. Migraines may require attention three times a day until relief is attained. Watch for more Color Acupressure in the Future.